Brand-new idea from the inventors of our best-selling Easy Fill baskets! These tough and rigid re-usable pricking out trays will give you spectacular results. UK designed and manufactured from tough UV stable plastic. You get 12 trays of 6, giving you a whopping 72 plants worth of capacity. Supplied as a pack of 12 trays, each with 6 individual plant cells. 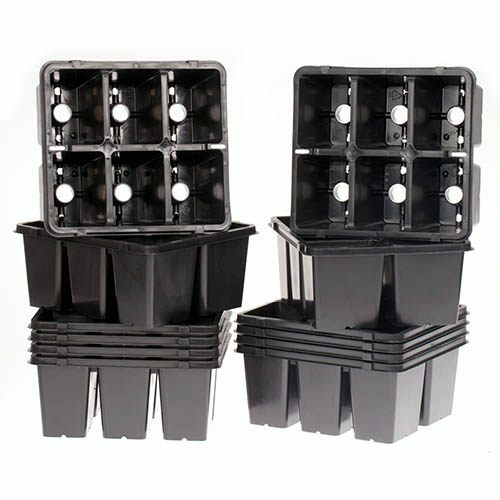 A fabulous brand-new idea from the clever inventors of our best-selling Easy Fill baskets, these tough and rigid re-usable seeding and pricking out trays have a unique design that will give you spectacular results with growing on your plug plants. They are also perfect for sowing sweet pea seeds as the depth of the pot allows plenty of room for development of roots - each pot will accomodate up to 6 seeds. UK designed and manufactured from tough UV stable plastic, they incorporate deep vents in the bottom of each cell, to allow air to pass into the root zone for quicker and better growing results. It doubles up as a handy pushing out hole too when rooted, minimising root damage when you plant them out! Each cell is ideal for pricking out small seedlings or our normal jumbo plugs, or for rooting your own cuttings. You get 12 trays of 6, giving you a whopping 72 plants worth of capacity. Try them and see the results in bigger plants more quickly. Perfect for growing on our maxiplugs and jumbo plugs for 3-4 weeks, they are very strong and ree-usable, unlike flimsy trays of plants in garden centres. A real gardeners find, they will save you money year after year! Supplied as a pack of 12 trays, each with 6 individual plant cells. Cell Dimensions: H = 7.5cm (3), W = 5.5cm (2), D = 8.5cm (2 ) Tray Dimensions: 19cm (8) x 17cm (7) = 6 cells per tray. Designed and manufactured in the UK from tough, UV stable plastic.